Apollo 16: "We Like Big Rocks"
April 1972: The fourth pair of astronauts to visit the moon were the most enthusiastic geologists, bringing home the largest sample ever collected from the moon. Apollo 16 launched on April 16, 1972 as the tenth crewed Apollo mission, and the fifth to attempt landing on the moon. Astronauts John W. Young and Charles M. Duke Jr. spent 71 hours on the lunar surface They completed 20 hours and 14 minutes of moonwalks during three extra-vehicular activities, including driving 26.7 kilometers (16.6 miles) in their lunar rover around the Descartes and Cayley formations. Along with installing a ultraviolet stellar camera on the surface, the duo collected 95.8 kilograms (209 pounds) of lunar samples. In an echo of geologists everywhere, they couldn’t seem to restrain themselves to just the small samples and collected the most massive lunar sample of any Apollo mission. Lunar Sample 61016 masses a mighty 11.7 kilograms (26 pounds). The rock bares the nickname “Big Muley,” named for Apollo 16 field geology team leader Bill Muehlberger. Found on the east rim of Plum Crater, researchers suspect it was actually ejected during the impact that formed South Ray crater. The rock is a breccia: a sedimentary rock composed of primary large, angular smaller rock fragments cemented together. The exposed top surface is rounded with a thin patina and micrometeorite zaps; the rest was protected by being buried within the lunar soil. The melted shock fragments within the rock date to 3.97 billion years ago. 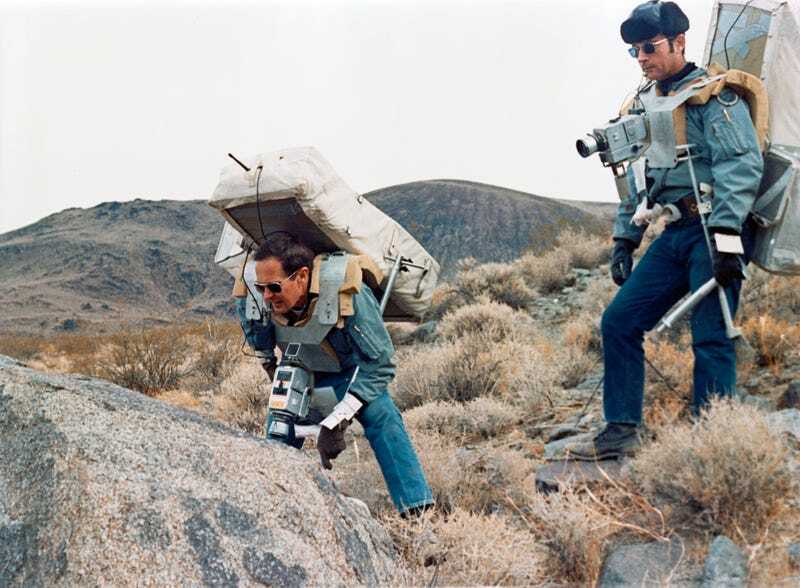 While Young and Duke were busy on the surface, Thomas Ke Mattingly II observed the moon; during the return trip to Earth he and Duke ducked outside for a one-hour spacewalk to retrieve film cassettes from the exterior. The crew returned to Earth just over 11 days after launching, splashing down on April 27th. The mission wasn’t without its hitches. It was the first Apollo mission to be delayed for technical issues, then a fuel tank was damaged during a routine test in the months leading up to launch, requiring replacement. Once the crew reached Earth orbit, the third stage booster developed an attitude control system problem that required in-flight fiddling to fix. The Lunar Module Orion started shedding paint peeling off the aluminum skin, although the astronauts decided it was cosmetic after closer inspection. Soon after, Mattingly spotted a gimbal lock warning light that the spacecraft wasn’t reporting attitude, so had to reorient the guidance system using the Sun and Moon instead. The next day, Young and Duke boarded Orion and peeled off for their decent. The lunar module’s engine backup systems malfunctioned, and error that should’ve scrapped the moon landing. Instead, mission controllers determined a workaround, descending to the surface just six hours behind schedule. This squeezed the surface mission schedule, and cut the final moonwalk by a few hours to accede to the demands of both orbital dynamics and sleep.